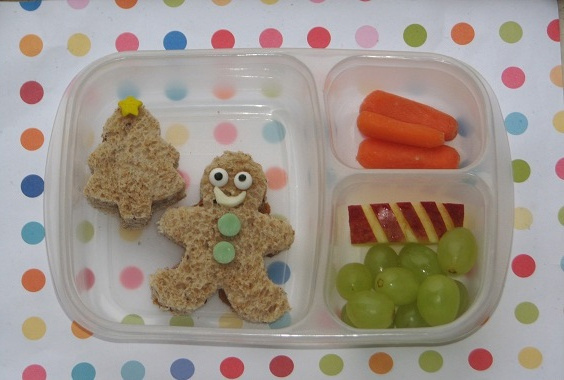 Continuing on with some winter theme bento, today Kidlet got a gingerbread man and a tree! I am happy every year that he grows older and still lets me pack cute bento for him! Of course now there are more rules....certain things are not okay and not always what I would expect! For now he still delights in seeing what I will pack for him and I love that! :) this is super cute! i love little gingerbreads. I have followed this blog for 4 years and have always been curious about the food amounts. My 5 year old eats more than this for lunch. Does he get a snack before or after lunch at school that you aren't showing or is he just a light eater? I am surprised that he still lets you at 11. I keep wondering at 5 if Reba is going to tell me that she is over it. Haha!